Queen Elizabeth II has emphasised the need for Britons to come together to "seek out the common ground", in what is being viewed as an appeal to overcome bitter divisions over Brexit. Government ministers quickly interpreted the comments -- a rare foray for the 92-year-old monarch into the political sphere -- as broadly supportive of their desperate search for a compromise over Brexit. The queen appeared to do so obliquely in an address late on Thursday to members of the Women's Institute (WI) near her Sandringham estate in eastern England -- an association that she joined while still a princess in 1943. "Of course, every generation faces fresh challenges and opportunities," she said. "I think there is huge wisdom in those words," finance minister Philip Hammond told BBC radio. "It's been our enormous strength over centuries that we have been able to find compromises that bring the nation together," he said. The royals tend to steer well clear of politics and, as head of state, the queen in particular is careful to stay neutral in public. Some Conservative MPs have suggested the queen can block any legislation seeking to delay or impede Brexit. During the referendum campaign in 2016, there was public uproar over a front-page headline in The Sun newspaper saying: "Queen Backs Brexit". Citing an anonymous source, the best-selling tabloid reported that the queen told the then deputy prime minister Nick Clegg, a fervent pro-European, during a lunch in 2011 that the EU was "heading in the wrong direction". The paper also claimed she had told lawmakers "with quite some venom and emotion" that "she did not understand Europe". An article in The Daily Beast before the referendum also said she had asked dinner companions to give her "three good reasons" why Britain should stay in the EU. Queen Elizabeth's grandson Prince William, who is second in line to the throne, made waves of his own during the referendum campaign. In a speech to British diplomats, he said Britain's ability to work with other nations was the "bedrock of our security and prosperity". The remarks prompted speculation that he was endorsing Britain's continued membership of the EU. Speaking after Harry's fairytale wedding to former TV actress Meghan Markle last year, her father Thomas Markle told ITV television that the prince had told him he was "open to the experiment" of Brexit. 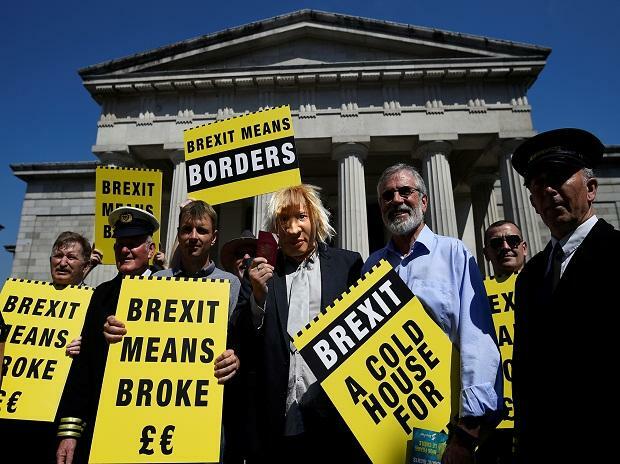 "Clearly the EU still inspires some in the UK," tweeted Guy Verhofstadt, the European Parliament's Brexit spokesman, while opposition Labour MP Paul Flynn jokingly referred to it as an "anti-Brexit hat". A year later, US President Donald Trump reignited the debate on the queen's private views, saying that he had discussed Brexit with her during an audience. He told the Mail on Sunday: "She said it's a very -- and she's right -- it's a very complex problem.